"Air India 182" redirects here. For the 2008 Canadian documentary film, see Air India 182 (film). Air India Flight 182 was an Air India flight operating on the Toronto–Montreal–London–Delhi route. On 23 June 1985, the Boeing 747-237B serving the flight (c/n 21473/330, registration VT-EFO, Emperor Kanishka) disintegrated in midair, at an altitude of 31,000 feet (9,400 m), as a result of the explosion from a bomb planted by Canadian Sikh terrorists. The remnants of the airliner and all aboard fell into the Atlantic Ocean approximately 120 miles (190 km) West-Southwest of the southwest tip of Ireland, killing all aboard. A total of 329 people were killed, including 268 Canadian citizens, 27 British citizens and 24 Indian citizens. The bombing of Air India Flight 182 is the largest mass killing in Canadian history, and was also the world's most destructive act of aviation terrorism until 9/11. The bombing of this flight occurred at the same time as the Narita Airport bombing; investigators believe that the two plots were linked, and that those responsible were aiming for a double bombing. However, the bomb at Narita exploded before it could be loaded onto the plane. Canadian law enforcement determined the main suspects in the bombing were members of the Sikh militant group Babbar Khalsa. The attack is thought to have been in retaliation to the Indian government's Operation Blue Star in which the Indian Army entered the Golden Temple in Amritsar to remove occupying Sikh militants. Although a handful of members were arrested and tried for the Air India bombing, the only person convicted was Inderjit Singh Reyat, a Canadian national and a member of the ISYF, who pleaded guilty in 2003 to manslaughter. He was sentenced to fifteen years in prison for assembling the bombs that exploded on board Air India Flight 182 and at Narita. The subsequent investigation and prosecution lasted almost twenty years. This was the most expensive trial in Canadian history, costing nearly C$130 million. The Governor General-in-Council in 2006 appointed the former Supreme Court Justice John C. Major to conduct a commission of inquiry. His report, which was completed and released on 17 June 2010, concluded that a "cascading series of errors" by the Government of Canada, the Royal Canadian Mounted Police (RCMP), and the Canadian Security Intelligence Service (CSIS) had allowed the terrorist attack to take place. 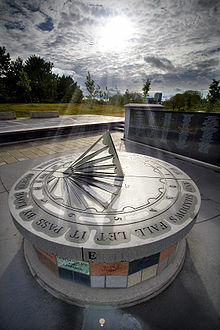 The rim of the sundial contains a poem reading "Time flies suns rise and shadows fall let it pass by love reigns forever over all". During the 1970s, many Sikh refugees emigrated to western Canada for better economic opportunities. These included men who became the leaders and members of the Babbar Khalsa, such as Talwinder Singh Parmar, Ajaib Singh Bagri, Ripudaman Singh Malik and Inderjit Singh Reyat. By the 1980s, the area around Vancouver, British Columbia, had become the largest centre of Sikh population outside India. On 13 April 1978 the festival of Vaisakhi in India, the day to celebrate the birth of Khalsa, a peaceful Sant Nirankari convention headed by their leader Gurbachan Singh was organized in Amritsar with permission from the Akali Dal state government. The practices of "Sant Nirankaris" sect of Nirankaris were considered heresy by the orthodox Sikhism expounded by Bhindranwale. From Golden Temple premises, Bhindranwale delivered an angry sermon in which he declared that he would not allow this convention and would go there and cut them to pieces. A procession of about two hundred Sikhs led by Bhindranwale and Fauja Singh of the Akhand Kirtani Jatha left the Golden Temple, heading towards the Nirankari Convention. Fauja attempted to behead Nirankari chief Gurbachan Singh with his sword but was shot dead by Gurbachan's bodyguard, while Bhindranwale escaped. In the ensuing violence, several people were killed: two of Bhindranwale's followers, eleven members of the Akhand Kirtani Jatha and three Nirankaris. A criminal case was filed against sixty two Nirankaris charged with the murder of 13 Sikhs by the Akali led government in Punjab. The case was heard in the neighbouring Haryana state, and all the accused were acquitted, on the basis that they acted in self-defence. The Punjab government decided not to appeal the decision. The case of Nirankaris received widespread support in the media and the orthodox Sikhs claimed this to be a conspiracy to defame the Sikh religion. Bhindranwale increased his rhetoric against the perceived enemies of Sikhs. A letter of authority was issued by Akal Takht to ostracize the Sant Nirankaris. A sentiment was created to justify extra judicial killings of the perceived enemies of Sikhism. The chief proponents of this attitude were the Babbar Khalsa founded by the widow, Bibi Amarjit Kaur of the Akhand Kirtani Jatha; the Damdami Taksal led by Jarnail Singh Bhindranwale who had also been in Amritsar on the day of the outrage; the Dal Khalsa, formed with the object of demanding a sovereign Sikh state; and the All India Sikh Students Federation, which was banned by the government. The founders of this Panthic group in Vancouver vowed to avenge the deaths of Sikhs. Talwinder Singh Parmar led the militant wing of AKJ, which became the Babbar Khalsa, to attack the Nirankaris. On 24 April 1980 Gurbachan Singh, the Baba (head) of the Nirankaris, was killed. A member of the Akhand Kirtani Jatha, Ranjit Singh, surrendered and admitted to the assassination three years later, and was sentenced to serve thirteen years at the Tihar Jail in Delhi. On 19 November 1981, Parmar was among the militants who escaped from a shootout in which two Punjab Police officers were gunned down outside the house of Amarjit Singh Nihang in Ludhiana district. This added to the notoriety of Babbar Khalsa and its leader. He went to Canada. In 1982, India issued a warrant for Parmar's arrest for six charges of murder, stemming from the killing of the police officers. India notified Canada that Parmar was a wanted terrorist in 1981 and asked for his extradition in 1982. Canada denied the request in July 1982. After an Interpol alert, Parmar was arrested while attempting to enter Germany. Germany chose to handle the case locally rather than transfer him over to India. Parmar went on a hunger strike to win his religious right to wear a turban and have vegetarian meals in the Düsseldorf jail. After India received information that Parmar had made assassination threats against Indira Gandhi, they found that Germany had decided that the evidence was weak. They had expelled Parmar and released him to Canada in June 1984 after nearly a year in jail. In 1983, militants led by Damdami Taksal Jathedar Jarnail Singh Bhindranwale had occupied Akal Takht of Golden Temple and amassed weapons in the Sikh temple. The militants were demanding more powers to the state from Central government and autonomy by changes in the Indian constitution. Or else they demanded creation of a Sikh state, to be called Khalistan. In the violent events since the inception of Akali Dharm Yudh Morcha, the militants had killed 165 Hindus and Nirankaris, even 39 Sikhs opposed to Bhindranwale were killed. The total number of deaths was 410 in violent incidents and riots while 1,180 people were injured. The Central government rejected the secessionist demands and on 3–6 June 1984, Prime Minister of India Indira Gandhi ordered Operation Blue Star, to remove the militants from the Golden Temple. Sikhs protested against the operation worldwide. On 31 October 1984, Indira Gandhi was assassinated by two of her Sikh bodyguards. In retaliation, 1984 anti-Sikh riots, guided by certain Indian National Congress members, killed thousands of Sikhs in India. Parmar visited Inderjit Singh Reyat, an auto mechanic and electrician who lived in Duncan, British Columbia, a small community north of Victoria on Vancouver Island. He asked him to construct a bomb; Reyat later claimed he had no idea for what it would be used. Reyat asked various people in the community about dynamite, saying he wanted to remove tree stumps on his property. Reyat also discussed explosives with a co-worker, while expressing anger at the Indian government and Indira Gandhi in particular. Later that year, Ajaib Singh Bagri accompanied Parmar as his right-hand man in the militancy against the Indian government. Bagri worked as a forklift driver at a sawmill near the town of Kamloops. He was known as a powerful preacher in the Indo-Canadian community. The pair traveled across Canada to incite Sikhs against the Indian government for conducting Operation Blue Star. They used the meetings as fundraisers for Babbar Khalsa. A former head priest in Hamilton testified that Bagri said, "The Indian Government is our enemy, the same way the Hindu society is our enemy." Bagri told a congregation, "Get your weapons ready so we can take revenge against the Indian Government". On 28 July 1984, the founding convention of the World Sikh Organization (WSO) was held at Madison Square Garden in New York City. The WSO's constitution was committed to diplomacy and non-violence, and it said the organisation would "strive for an independent Sikh homeland by peaceful means." Although Parmar was blocked at the border (he had been put under 24-hour watch), Bagri gave an hour-long speech at the convention. A professional translator testified later as a witness that Bagri's speech in Punjabi had been distorted by observers who failed to understand "its context within Sikh history and literature;" he denied that Bagri had urged Sikhs to take revenge against all Hindus. He conceded that Bagri was trying to "inflame passions and arouse national pride". In late 1984, at least two informers reported to authorities on the first abortive plot to bomb Air India Flight 182, which then flew out of Montreal's Mirabel International Airport. In August 1984, the known criminal Gerry Boudreault claimed that Talwinder Parmar showed him a suitcase stuffed with $200,000 payment if he would plant a bomb on a plane. He decided, "I had done some bad things in my time, done my time in jail, but putting a bomb on a plane ... not me. I went to the police." In September, in an attempt to get his sentence for theft and fraud reduced, Harmail Singh Grewal of Vancouver told the Canadian Security Intelligence Service (CSIS) and the Royal Canadian Mounted Police (RCMP) of the plot to bomb the flight from Montreal. Both reports were dismissed as unreliable. The moderate Sikh Ujjal Dosanjh had spoken out against violence by Sikh extremists. He was attacked in February 1985 by an assailant wielding an iron bar. His skull was broken and he required 80 stitches in his head. On 5 March 1985, three months before the bombing, the CSIS obtained a court order to place Parmar under surveillance for one year. Although the Babbar Khalsa had not yet been officially banned, the affidavit for surveillance stated, it "is a Sikh terrorist group now established in Canada", it "has claimed responsibility for more than forty assassinations of moderate Sikhs and other persons in the Punjab," and "penned its name to threatening letters [addressed to] ... high officials in India". The affidavit said that on 15 July 1984, Parmar urged the Coach Temple congregation of Calgary, Alberta, to "unite, fight and kill" to avenge the attack on the Golden Temple. In April 1985, a Canadian familiar with blasting was asked by Reyat how much dynamite it would take to blow up a tree stump. Reyat asked numerous people in Duncan about explosives, and expressed the need for revenge. Reyat sought cases of dynamite and appeared willing to pay three times the normal price. He eventually confided to one acquaintance that it was not about stumps, but "trouble in the old country", that he needed "explosives to help my countrymen." One friend declined to get him dynamite, but did lend him a 400-page manual on mining with explosives. On 8 May 1985, Reyat bought a Micronta digital automobile clock at the RadioShack store in Duncan. Designed for a 12-volt automobile electrical system, it could also be powered by a 12-volt lantern battery. The 24-hour alarm activated a buzzer. Reyat returned to the store a week later to buy an electrical relay, after asking how to get the buzzer signal to power another device. Wiretappers recorded nine telephone calls in one month between Reyat and Parmar's residence in Vancouver; Reyat called either from his residence or workplace on Vancouver Island. As a result of this activity, the government added Reyat to the list of persons being monitored for terrorist activities. The Canadian government would later accuse Reyat of lying in 2003, when at first he said he did not know for what the three clocks he had bought could be used. He later said Parmar needed an explosive device to blow up a bridge or something large in India, and that he needed timers for an explosive device. The relay could be used to trigger the detonator circuit for a blasting cap, which would provide the initial shock needed to detonate larger explosives, such as dynamite. Reyat later visited a television repair shop, seeking help for a partially disassembled car clock wired to a lantern battery. He claimed that he needed help so that the buzzer stayed on rather than intermittently beeping, so that it would turn on a light in his camper to wake him up. The repairman knew his friend did not own a camper. Justice J. Raymond Paris said at Reyat's 1991 trial that this was an odd use for a timer. By mid-May, Reyat had gone into the woods to test a device with a 12-volt battery, cardboard cylinder, gunpowder, and some dynamite, but the device failed to work. The wooded area was in proximity to Duncan and Paldi. Later, Reyat acquired between six and eight sticks of dynamite "to blow up unidentified stumps if need be in the future" from a Duncan well driller after visiting his house to fix a truck. He also obtained a few blasting caps days later. On 31 May 1985, Reyat brought his timer, attached to a boombox, into his shop so that his fellow employee at Duncan Auto Marine Electric could help him fix it for a friend, but he returned the radio after it did not work properly. On 4 June, CSIS agents Larry Lowe and Lynn Macadams followed Parmar and a "youthful man" (identified only as "Mr. X", "Third Man" or "Unknown Male") as they went from Parmar's house to the Horseshoe Bay Ferry Terminal, rode the Nanaimo-bound ferry, and visited Reyat at his home and shop at Auto Marine Electric. The three drove to a deserted bush area, where Reyat was observed taking an object into the woods. Staying out of sight, the agents, who did not bring a camera, only heard an explosion which sounded like a "loud gunshot". Later tests showed it could also have been an explosion, and later searches turned up remnants of an aluminium "electrical blasting cap". J.S. Warren, director-general of counter-terrorism at CSIS, would later ask on 16 July 1986 why they did not ask the police to stop and question the suspects, or search the vehicle, which might have deterred the bombing plot. The next day, Reyat purchased a large Sanyo component tuner, model FMT 611 K, at Woolworths, and left his name and telephone number on the charge slip, which was later found in a search of his home. Reyat also bought smokeless gunpowder from a sporting goods store, signing "I. Reyat" on the explosives log. Study of debris from the Narita explosion would eventually show the bomb had been housed inside a Sanyo tuner with a serial number matching a model sold only in British Columbia, and used a Micronta clock as a timer, which powered a relay with an Eveready 12-volt battery to trigger blasting caps to set off a high explosive consistent with sticks of dynamite, all matching items purchased by Reyat. This would lead to his eventual conviction. As late as 2010, Reyat admitted only to buying and assembling some parts, but denied he ever made a bomb, knew what the bomb was to be used for, who was behind any plot, or that he ever asked or knew the name of the man who he said stayed in his house for a week completing construction of the explosive device after his device failed. On 9 June 1985, a police informer in Hamilton reported that Parmar and Bagri had visited the Malton Sikh Temple, warning the faithful that "it would be unsafe" to fly Air India. Vancouver police also monitored militants 11 days before the bombing. A leader of the International Sikh Youth Federation complained that no Indian consuls or ambassadors had yet been killed, but the response was, "You will see. Something will be done in two weeks". This conversation appears to be an order from Parmar to book the airline tickets. It is believed that "writing the story" referred to purchasing the tickets; afterward, Johal phoned Parmar back and asked if he could "come over and read the story he asked for", to which Parmar agreed. Moments after the wiretapped conversation, at 01:00 UTC, a man calling himself "Mr. Singh" made reservations for two flights on 22 June: one for "Jaswant Singh" to fly from Vancouver to Toronto on Canadian Pacific Air Lines (CP) Flight 086 and one for "Mohinderbel Singh" to fly from Vancouver to Tokyo on Canadian Pacific Air Lines Flight 003 and connect to Air India Flight 301 to Bangkok. At 02:20 UTC on the same day, another call changed the reservation in the name of "Jaswant Singh" from CP 086 to CP 060, also flying from Vancouver to Toronto. The caller further requested to be put on the waiting list for AI 181 from Toronto to Montreal and AI 182 from Montreal to Bombay. The next day, at 19:10 UTC, a man wearing a turban paid for the two tickets with $3,005 in cash at a CP ticket office in Vancouver. The names on the reservations were changed: "Jaswant Singh" became "M. Singh" and "Mohinderbel Singh" became "L. Singh". The reservation and purchase of these tickets together would be used as evidence to link the two flights to one plot. One telephone number left as a contact was Vancouver's Ross Street Sikh temple. The other number became one of the first leads tracked by investigators, and was traced to Hardial Singh Johal, a janitor at a Vancouver high school. Johal was an avid follower of Talwinder Singh Parmar, and thus closely scrutinised in the investigation following the Air India bombing. He was alleged to have stored the suitcase explosives in the basement of a Vancouver school and to have purchased the tickets for the flights on which the bombs were placed. Mandip Singh Grewal recounted how he saw and recognised Johal as his school's janitor when he said goodbye to his father, one of the Flight 182 victims, at the airport on the day of the bombing. Reyat went to work on 21 June. Phone records show he called Johal at 7:17 p.m. A witness whose name was protected testified that Bagri asked to borrow her car the night before the bombing to take some suitcases to the airport, though he would not be flying with them. Another photo of VT-EFO at Heathrow Airport, taken on 31 May, 23 days before the bombing. On 22 June 1985, at 13:30 UTC, a man calling himself "Manjit Singh" (checked in as M. Singh) called to confirm his reservations on Air India Flight 181/182. He was told he was still wait-listed, and was offered alternative arrangements, which he declined. At 15:50 UTC (8:50 a.m.), M. Singh checked into a busy line of 30 people for the CP flight from Vancouver to Toronto, which was scheduled to leave at 9:18 a.m. He asked agent Jeannie Adams to check his dark brown, hard-sided Samsonite suitcase, and have it transferred to Air India Flight 181 and then to Flight 182 to India. The agent initially refused his request to inter-line the baggage since his seat from Toronto to Montreal and from Montreal to Bombay was unconfirmed. He insisted, but the agent again rebuffed him, telling him, "Your ticket doesn't read that you're confirmed" and "we're not supposed to check your baggage through." The man said, "Wait, I'll get my brother for you." As he started to walk away, she relented and agreed to accept the bag, but told him he would have to check in again with Air India in Toronto. After the crash, Adams would realise this deception got the bag on its way to Flight 182. The anxious man was never identified. At 16:18 UTC (9:18 a.m.), Canadian Pacific Air Lines Flight 60 to Toronto Pearson International Airport departed without Singh. Reyat would later testify that he travelled by ferry from Duncan to Vancouver that morning to work on his brother's truck. Phone records show someone called from his residence in Duncan to Johal's number at 10:50 a.m. and 4:00 p.m. later that day. Reyat was seen in the company of another East Indian man at the Auto Marine Electric store in Burnaby, near Parmar's house, between 10:00 a.m. and 11:30 a.m. He bought two 12 volt batteries similar to the one used in the explosive device tested in the woods, and they were to fit into a special metal bracket he had brought with him. Constable Clark-Marlowe later believed there was "ample time for Inderjit Singh Reyat to obtain the batteries at the Auto Marine Electric limited store in Burnaby, incorporate the batteries in the assembly of an explosive device and then have the device transported in a suitcase to the Vancouver airport". At 20:22 UTC, Canadian Pacific Air Lines Flight 60 arrived in Toronto twelve minutes late. Some of the passengers and baggage, including the bag M. Singh had checked in, were transferred to Air India Flight 182. In response to threats from Sikh activists, Air India had requested extra security, leading Canada to assign extra policemen in terminals in Toronto and Montreal, and all baggage was to be checked by X-ray or by hand. But after the X-ray machine broke down that day, inspectors used a portable PDD-4 explosive sniffer. An Air India security officer had demonstrated that it made a loud scream when a lit match was held an inch away, and showed that it should be used around the edge of the bag being tested. Between 5:15 and 6:00, the sniffer was heard to beep at a soft-sided maroon suitcase with a zipper going all around; it beeped in a low volume near the zipper lock. But Air India was not informed since checkers were not instructed on how to react to only a short beep, so they allowed the bag to pass on its way. Later investigation would determine that the two containers that could have contained M. Singh's bag were placed close to the sensitive electronic bay of the aircraft. At 00:15 UTC on 23 June, Air India Flight 181, a Boeing 747-237B named Emperor Kanishka, departed Toronto Pearson International Airport for Montréal–Mirabel International Airport. The aircraft was an hour and 40 minutes late because a "fifth pod" (a spare engine) was installed under the aircraft below the left wing to be flown to India for repairs. Some of the parts had to be stored in the rear cargo compartment. The 5th pod engine was a serviceable spare engine that had been on lease to Air Canada after one of their Boeing 747s suffered an engine failure on the way to India. That engine received a post lease inspection and was declared serviceable by Air Canada personnel. The plane arrived in Montréal-Mirabel International Airport at 01:00 UTC. There, it became the ill-fated Flight 182. Flight 182 departed for London Heathrow Airport, en route to Palam International Airport, Delhi, and Sahar International Airport, Bombay. 329 people were on board: 307 passengers and 22 crew. Captain Hanse Singh Narendra served as the captain, with Captain Satwinder Singh Bhinder as the first officer and Dara Dumasia as the flight engineer. Many of the passengers were going to visit family and friends. At 07:14:01 GMT, the crew of the Boeing 747 "squawked 2005" (a routine activation of its aviation transponder) as requested by Shannon Airport Air Traffic Control (ATC), then vanished from the radar screens. At exactly the same time, a bomb in a Sanyo tuner in a suitcase in the forward cargo hold exploded while the plane was at 31,000 feet (9,400 m) at 51°3.6′N 12°49′W﻿ / ﻿51.0600°N 12.817°W﻿ / 51.0600; -12.817. It caused explosive decompression and the break-up of the aircraft in mid-air. The wreckage settled in 6,700 feet (2,000 m) deep water off the south-west Irish coast, 120 miles (190 km) offshore of County Cork. No "mayday" call was received by Shannon ATC. ATC asked aircraft in the area to try to contact Air India, to no avail. By 07:30:00 GMT, ATC had declared an emergency and requested nearby cargo ships and the Irish Naval Service vessel LÉ Aisling to look out for the aircraft. Meanwhile, sometime before 20:22 UTC (1:22 p.m.), L. Singh (also never identified) checked in for the 1:37 p.m. CP Air Flight 003 to Tokyo with one piece of luggage, which was to be transferred to Air India Flight 301 to Bangkok. However, L. Singh did not board the flight. The second bag checked in by L. Singh went on Canadian Pacific Air Lines Flight 003 from Vancouver to Tokyo. There were no x-ray inspections of luggage on this flight. Its target was Air India Flight 301, due to leave with 177 passengers and crew bound for Bangkok-Don Mueang, but 55 minutes before the Flight 182 bombing, it exploded at the terminal in Narita International Airport. Two Japanese baggage handlers were killed and four other people were injured. It appears the conspirators meant for both bombings to occur simultaneously, but they neglected to take into account that Japan does not observe daylight saving time, as does Canada. By 09:13 UTC, the cargo ship Laurentian Forest discovered wreckage of the aircraft and many bodies floating in the water. India's civil aviation minister announced the possibility that the plane had been destroyed by a bomb, and the cause was probably some sort of explosion. Previous 747s had been damaged or destroyed on the ground, but this was the first jumbo jet downed by sabotage. The bomb killed all 22 crew and 307 passengers. Of those, 132 bodies were recovered; 197 were lost at sea. 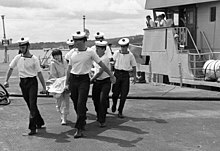 Eight bodies exhibited "flail pattern" injuries, indicating that they had exited the aircraft before it hit the water. This was a sign that the aircraft had broken up in mid-air. Twenty-six bodies showed signs of hypoxia (lack of oxygen). Twenty-five, mostly victims who were seated near windows, showed signs of explosive decompression. Twenty-three had signs of "injuries from a vertical force". Twenty-one passengers were found with little or no clothing. "The other significant findings were large amounts of frothy fluid in her mouth and nostrils, and all of the air passages and the lungs were water-logged and extremely heavy. There was water in the stomach and the uterine. The uterus contained a normal male fetus of approximately five months. The fetus was not traumatized and in my opinion death was due to drowning." Additional evidence to support a bombing was retrieved from the broken up aircraft, which lay on the sea bed at a depth of 6,700 feet (2,000 m). The British vessel Guardline Locator, equipped with sophisticated sonar, and the French cable-laying vessel Léon Thévenin, with its robot submarine Scarab, were dispatched to locate the flight data recorder (FDR) and cockpit voice recorder (CVR) boxes. The boxes would be difficult to find and it was imperative that the search commence quickly. By 4 July, the Guardline Locator detected signals on the sea bed. On 9 July, Scarab pinpointed the CVR and raised it to the surface. The next day, the FDR was also located and recovered. In 1985, Canadian coast Guard Ship (CCGS) John Cabot participated in the investigations, mapping the underwater wreckage of the aircraft. A casualty list was provided by the Canadian Broadcasting Corporation. The victims included 268 Canadians, 27 Britons, and 24 Indians. Canadians of Indian descent made up the majority of the passengers. Between 82 to 86 passengers were children, including six infants. There were 29 entire families on the plane. Two children not on board had both parents on board, resulting in them becoming orphaned. There were six sets of children of their entire families. There were 32 people not on the aircraft who had the remaining members of their families on board. Most of the victims resided in southern Ontario and were Hindus. Some of the victims were Sikhs; around 35 passengers were Sikhs from Greater Montreal. In terms of metropolitan areas, the Greater Toronto Area was the home of the majority of the passengers, with Greater Montreal also having the next largest number of passengers. Some passengers originated from British Columbia. Forty-five passengers were employees of Air India or relatives of Air India employees. Notable passengers and crew included Inder Thakur, an Air India purser and former actor, and Yelavarthy Nayudamma, a scientist and chemical engineer. Hundred and five passengers boarded the flight at Mirabel Airport, while 202 passengers who traveled on Flight 182 had boarded at Toronto Pearson Airport. The report stated that interlining passengers boarding Flight 181 in Toronto who became passengers on Flight 182 included ten passengers connecting from Vancouver, five passengers from Winnipeg, four passengers from Edmonton, and two passengers from Saskatoon. It stated that all of these passengers had taken flights on Air Canada, and no interlining passengers boarded Flight 182 in Montreal. In the documentary Air India 182 Renée Sarojini Saklikar stated that her aunt and uncle had taken a Canadian Pacific Air Lines flight from Vancouver to connect to Air India 182; the two were on AI182 while it was in Montreal. The flight crew and cabin crew of Flight 182 had boarded in Toronto and commanded the segment of Flight 181 from Toronto to Montreal. There were 68 persons who cleared customs in Toronto and were scheduled to re-board Flight 181 so they could travel to their final destination, Montreal. There was a practice of passengers who intended to fly to Toronto actually buying tickets to Montreal, because tickets to Montreal had a lower cost than tickets to Toronto. On the flights going to Canada, such passengers simply disembarked in Toronto and chose not to re-board the flight to Montreal. Three passengers scheduled to go onward to Montreal never re-boarded Flight 181, and so there were 65 passengers destined for Montreal who flew the Toronto-to-Montreal segment. Within hours, Canada's Indian community was a focus of attention as victims and among hints that officials were investigating connections to the Sikh separatists who had threatened and committed acts of violence in retaliation against Hindus. In the subsequent worldwide investigations over six years, many threads of the plot were uncovered. Based on recovery of wreckage and bodies from the surface, it was decided to retrieve wreckage and recorders from the bottom of the sea. That voice and flight recorders were cut out at the same time, and damage to parts recovered from the forward cargo bay consistent with a blast, established that it was probably a bomb near the forward cargo hold that brought the plane down suddenly. The flight was also soon linked to the earlier bombing in Japan which had also originated from Vancouver; tickets for both flights had been purchased by the same person, and in both cases the planes were carrying bags without the passenger who checked them in. One of the problems the investigators thought may have been the reason of the supposed crash was that the aircraft was carrying a spare engine. Therefore, there would have been more weight on one side. This reason was ruled out as the flight recorders relayed information of the rudder position which assists in the carrying of a 5th engine. Carrying a 5th engine helped airlines carry broken engines back to be maintained. No bomb parts were recovered from the ocean, but investigations of the blast at Tokyo established that the bomb had been placed in a Sanyo stereo tuner of a series that had been shipped to Vancouver in Canada. The RCMP assigned no less than 135 officers to check every store that could have sold Sanyo tuners, leading to the discovery of a recent sale to mechanic Inderjit Singh Reyat in his hometown of Duncan, British Columbia. RCMP contacted the CSIS and found they were already investigating the Sikh activists; RCMP learned that CSIS already had wiretaps and had observed Reyat and Parmar at the test blast near Duncan, and had recovered blasting cap shunts and a paper bundle wrapper from a blasting cap. A search recovered the receipt for a Sanyo Tuner Model FMT-611K with invoice with his name and phone number, along with sales of other bomb components. It was not until January 1986 that Canadian investigators at the Canadian Aviation Safety Board concluded that a bomb explosion in the forward cargo hold had downed the airliner. On 26 February 1986, Supreme Court Judge Kirpal of India presented an inquiry report based on investigation conducted by H.S. Khola (the "Khola Report"). The report also concluded that a bomb originating in Canada brought down the Air India flight. Based on observations, wiretaps, searches and arrests of persons believed to be participants, the bombing was determined to be the joint project of at least two Sikh terrorist groups with extensive membership in Canada, the United States, Britain and India. Their anger had been sparked by the June 1984 assault on the Golden Temple by the Government of India. The main suspects in the bombing were members of a Sikh separatist group called the Babbar Khalsa (banned in Europe and the United States as a proscribed terrorist group) and other related groups who were at the time agitating for a separate Sikh state called Khalistan in Punjab, India. Talwinder Singh Parmar, a Canadian citizen born in Punjab and living in British Columbia, was a high-ranking official in the Babbar Khalsa. His phone was tapped by CSIS for three months before the bombing. He was killed by the Punjab police in 1992 in an encounter with six other terrorists. Ajaib Singh Bagri was a mill worker living in Kamloops. He said in a 1984 speech, after Hindu mobs had murdered three thousand Sikhs in Delhi and other places in retaliation for the assassination of the Prime Minister of India by her Sikh bodyguards, that "Until we kill 50,000 Hindus, we will not rest." He and Malik were acquitted in 2005. Hardial Singh Johal and Manmohan Singh were both followers of Parmar and active in the Gurdwaras where Parmar preached. On 15 November 2002, Johal died of natural causes at age 55. His phone number was left when ordering the airline tickets, he was seen at the airport the day the luggage was loaded, and he had allegedly stored the suitcases containing the bombs in the basement of a Vancouver school, but was never charged in the case. Daljit Sandhu was later named by a Crown witness as the man who picked up the tickets. During the trial, the Crown played a video from January 1989 in which Sandhu congratulated the families of Indira Gandhi's assassins and stated that "she deserved that and she invited that and that's why she got it". Sandhu was cleared by Judge Ian Josephson in a 16 March judgment. Lakhbir Singh Rode was the leader of the Sikh separatist organisation International Sikh Youth Federation. In September 2007, the commission investigated reports, initially disclosed in the Indian investigative news magazine Tehelka, that Parmar had allegedly confessed and named the hitherto-unnamed Lakhbir Singh Rode as the mastermind behind the explosions. This claim appears to be inconsistent with other evidence known to the RCMP. On 17 August 1985, Reyat became a third suspect once the receipt for the tuner was found with his name. On 6 November 1985, the RCMP raided the homes of suspected Sikh separatists Parmar, Reyat, Gill and Johal. [dead link] In a 4-1/2-hour interview, Reyat denied all knowledge of the test blast or even Parmar. After he was told the CSIS had seen both of them, he changed his story that Parmar really wanted to build a device powerful enough so that he could take the device back to India to destroy a bridge. He explained that the gunpowder in the test was a failure, as the device fizzled. The search of Reyat's house produced a carton with an unusual green tape also found in the Narita blast and a can of Liquid Fire-brand starting fluid matching fragments found at the blast site, along with blasting caps and dynamite, including a pound of dynamite in a bag taken out its original tube casing, though none was consistent with blast residue. Reyat insisted only the clock, relays and tuner had been purchased for other than "benign purposes". There was insufficient evidence to hold Parmar as charges were dropped days later. Bagri would later state before his later trial that he knew he was probably a suspect by October 1985, but insisted he would have faced charges if there were any evidence he had anything to do with the bombing. It was established by November that it was a man with a Sikh name who probably checked the bag in Vancouver that caused the crash. Parmar was not seen in Canada sometime after late 1986, as authorities believed him to be living in Pakistan where he continued operations against India. Authorities initially lacked evidence to link Reyat directly to either the Narita or Air India blasts and pursue a conspiracy to commit murder charge. Instead, Reyat pleaded guilty on 29 April 1986 to possession of an explosive substance and possession of an unregistered firearm. His sentence was a light $2,000 fine. Just three months later, Reyat moved his family from Canada to Coventry, near Birmingham, in the UK. Reyat was soon hired at a Jaguar factory where he worked for nearly two years. RCMP Mounties working with prosecutor Jardine and RCMP and Japanese experts eventually determined the components of the bomb from fragments and matched them with items that Reyat possessed or had purchased. Prosecutor Jardine visited Tokyo five times to meet with Japanese authorities, and Canada formally asked that evidence to be sent to Canada. Still lacking sufficient evidence for a murder charge, Jardine recommended two manslaughter charges and five explosives-related counts, resulting in a request to Britain to extradite Reyat, who was arrested on 5 February 1988 as he was driving to the Jaguar car plant. After lengthy proceedings to extradite him from Britain, Reyat was flown to Vancouver on 13 December 1989 and his trial began 18 September 1990. On 10 May 1991, he was convicted of two counts of manslaughter and four explosives charges relating to the Narita Airport bombing. He was sentenced to 10 years imprisonment. Fifteen years after the bombing, on 27 October 2000, RCMP arrested Malik and Bagri. They were charged with 329 counts of first-degree murder in the deaths of the people on board Air India Flight 182, conspiracy to commit murder, the attempted murder of passengers and crew on the Canadian Pacific flight at Japan's New Tokyo International Airport (now Narita International Airport), and two counts of murder of the baggage handlers at New Tokyo International Airport. It became known as the "Air India Trial". I began by describing the horrific nature of these cruel acts of terrorism, acts which cry out for justice. Justice is not achieved, however, if persons are convicted on anything less than the requisite standard of proof beyond a reasonable doubt. Despite what appear to have been the best and most earnest of efforts by the police and the Crown, the evidence has fallen markedly short of that standard. In a letter to the Attorney General of British Columbia, Malik demanded compensation from the Canadian government for wrongful prosecution in his arrest and trial. Malik owes the government $6.4 million and Bagri owes $9.7 million in legal fees. In February 2006, Reyat was charged with perjury with regard to his testimony in the trial. The indictment was filed in the Supreme Court of British Columbia and lists 27 instances in which Reyat allegedly misled the court during his testimony. Reyat had pleaded guilty to constructing the bomb, but denied under oath that he knew anything about the conspiracy. I find him to be an unmitigated liar under oath. Even the most sympathetic of listeners could only conclude, as do I, that his evidence was patently and pathetically fabricated in an attempt to minimise his involvement in his crime to an extreme degree, while refusing to reveal relevant information he clearly possesses." On 3 July 2007, with perjury proceedings still pending, Reyat was denied parole by the National Parole Board, which concluded he was a continued risk to the public. The decision meant Reyat had to serve his full five-year sentence, which ended 9 February 2008. Reyat's perjury trial began in March 2010 in Vancouver, but was abruptly dismissed on 8 March 2010. The jury was dismissed after "biased" remarks about Reyat by a woman juror. In January 2013, the Supreme Court of Canada rejected Reyat's bid to appeal his perjury conviction. The country's top court did not disclose its reasons as per customary practice. In March 2014, the British Columbia Court of Appeal dismissed Reyat's appeal that the nine-year length of the sentence, the country's longest sentence for perjury, was unfit. The court ruled the gravity of the perjury in such a case was without comparison. Inderjit Singh Reyat was released by Canadian Government on Parole on 28 January 2016 after 30 years in prison. He was released from a halfway house less than 13 months later on 14 February 2017, with restrictions. The Canadian government had been warned by the Indian government about the possibility of terrorist bombs aboard Air India flights in Canada, and over two weeks before the crash, CSIS reported to the RCMP that the potential threat to Air India as well as Indian missions in Canada was high. In his verdict, Justice Josephson cited "unacceptable negligence" by CSIS when hundreds of wiretaps of the suspects were destroyed. Of the 210 wiretaps that were recorded during the months before and after the bombing, 156 were erased. These tapes continued to be erased even after the terrorists had become the primary suspects in the bombing. Because the original wiretap records were erased, they were inadmissible as evidence in court. CSIS claimed the wiretap recordings contained no relevant information, but an RCMP memo states that "There is a strong likelihood that had CSIS retained the tapes between March and August 1985, that a successful prosecution of at least some of principals in both bombings could have been undertaken." Tara Singh Hayer, the publisher of the Indo-Canadian Times and a member of the Order of British Columbia, provided an affidavit to the RCMP in 1995 claiming that he was present during a conversation in which Bagri admitted his involvement in the bombings. While at the London offices of fellow Sikh newspaper publisher Tarsem Singh Purewal, Hayer claimed he overheard a meeting between Purewal and Bagri in which Bagri stated that "if everything had gone as planned the plane would have blown up at Heathrow airport with no passengers on it. But because the plane was a half-hour to three-quarters of an hour late, it blew up over the ocean." On 24 January that same year, Purewal was killed near the offices of the Des Pardes newspaper in Southall, England, leaving Hayer as the only other witness. On 18 November 1998, Hayer was shot dead while getting out of his car in the garage of his home in Surrey. Hayer had survived an earlier attempt on his life in 1988, but was paralysed and used a wheelchair. As a consequence of his murder, the affidavit was inadmissible as evidence. This was later cited as a reason why the suspects in the bombing were eventually acquitted in 2005. During an interview with Bagri on 28 October 2000, RCMP agents described Surjan Singh Gill as an agent for CSIS, saying the reason that he resigned from the Babbar Khalsa was because his CSIS handlers told him to pull out. After the subsequent failure of CSIS to stop the bombing of Flight 182, the head of CSIS was replaced by Reid Morden. In an interview for CBC Television's news program The National, Morden claims that CSIS "dropped the ball" in its handling of the case. A Security Intelligence Review Committee cleared CSIS of any wrongdoing. However, that report remains secret to this day. The Canadian government continues to insist that there was no mole involved. On 1 May 2006, the Crown-in-Council, on the advice of Prime Minister Stephen Harper, announced the launch of a full public inquiry into the bombing, headed by retired Supreme Court Justice John Major, to find "answers to several key questions about the worst mass murder in Canadian history." Initiated later in June, the Commission of Inquiry into the Investigation of the Bombing of Air India Flight 182 was to examine how Canadian law restricted funding terrorist groups, how well witness protection is provided in terrorist cases, if Canada needed to upgrade its airport security, and if issues of co-operation between the RCMP, CSIS, and other law enforcement agencies had been resolved. It was to also provide a forum wherein families of the victims could testify on the impact of the bombing and would not repeat any criminal trials. The inquiry's investigations were completed and released on 17 June 2010. Major concluded that a "cascading series of errors" by Crown ministries, the RCMP, and CSIS allowed the terrorist attack to take place. After the release of the findings, Stephen Harper announced in the media, on the 25th anniversary of the disaster, that he would "acknowledge the catastrophic failures of intelligence, policing and air security that led to the bombing, and the prosecutorial lapses that followed" and deliver an apology on behalf of the sitting Cabinet of Canada. "Make no mistake: The flight may have been Air India's, it may have taken place off the coast of Ireland, but this is a Canadian tragedy." In May 2007, Angus Reid Strategies released the results of public opinion polling of whether Canadians viewed the Air India bombing as a Canadian or Indian tragedy and whom they blamed. Forty-eight per cent of respondents considered the bombing as a Canadian event, while twenty-two per cent thought it was a mostly Indian affair. Thirty-four per cent of those asked felt both CSIS and airport security personnel deserved a great deal of the blame in addition to twenty-seven per cent who believed the RCMP were largely to blame. Eighteen per cent mentioned Transport Canada. "In truth, it was never close to that. The date, 23 June 1985, is not seared into the nation's soul. The events of that day snuffed out hundreds of innocent lives and altered the destinies of thousands more, but it neither shook the foundations of government, nor transformed its policies. It was not, in the main, even officially acknowledged as an act of terrorism." CBC Television announced the start of filming for Flight 182, a documentary about the tragedy directed by Sturla Gunnarsson. Its title was changed to Air India 182 before premiering at the Hot Docs Canadian International Documentary Festival in Toronto in April 2008. It subsequently premiered on CBC Television in June. The crash was featured in Season 5 of the Canadian made, internationally distributed documentary series Mayday, on the episode "Air India: Explosive Evidence". Many journalists have commented on the bombing throughout the decades since it occurred. Eight months after the bombing, The Province newspaper reporter Salim Jiwa published Death of Air India Flight 182. Loss of Faith: How the Air-India Bombers Got Away With Murder was published by The Vancouver Sun reporter Kim Bolan in May 2005. Jiwa and fellow reporter Don Hauka published Margin of Terror: A reporter's twenty-year odyssey covering the tragedies of the Air India bombing in May 2007. In her short story, "The Management of Grief," Indian-born American writer Bharati Mukherjee uses fiction to explore the enduring grief of relatives of Air India 182 victims. "The Management of Grief" was originally published in the fiction collection The Middleman and Other Stories. Mukherjee also co-authored The Sorrow and the Terror: The Haunting Legacy of the Air India Tragedy (1987) with her husband, Clark Blaise. Inspired by mainstream Canada's cultural denial of the Air India tragedy, Neil Bissoondath wrote The Soul of All Great Designs. Canadian poet Renée Sarojini Saklikar created a collection of memorial and response poems, Children of Air India: unauthorised exhibits and interjections (Nightwood Editions 2013). The Air India bombing is central to the plot of the novel All Inclusive by Toronto-based author Farzana Doctor. The Pada memorial awards at Laurentian University were established in honour of victim Vishnu Pada, the husband of Lata Pada, Indian-born Canadian choreographer and Bharatanatyam dancer. The University of Manitoba created the Donald George Lougheed Memorial Scholarship in honor of Air India victim Donald George Lougheed. It is awarded to computer engineering students. Laxminarayan and Padmini Turlapati, the parents of victims Sanjay and Deepak Turlapati, created the Sanjay Deepak Children Trust. Sankurathri Foundation was established by Dr. Chandra Sekhar Sankurathri in Kakinada, Andhra Pradesh in memory of his wife Manjari, son Sri Kiran and daughter Sarada, victims of the Air India Flight 182. SF implements educational programs through Sarada Vidyalayam, health care programs through Sri Kiran Institute of Ophthalmology and disaster relief programs through Spandana. ^ Frías, Ana Salinas de; Samuel, Katja; White, Nigel (19 January 2012). Counter-Terrorism: International Law and Practice. OUP Oxford University Press. p. 335. ISBN 9780199608928. ^ a b Hoffman, Bruce; Reinares, Fernando (28 October 2014). The Evolution of the Global Terrorist Threat: From 9/11 to Osama bin Laden's Death. Columbia University Press. p. 144. ISBN 9780231537438. ^ Flight 182 (Canada), Commission of Inquiry into the Investigation of the Bombing of Air India; Major, John Charles (2010). Air India Flight 182: A Canadian Tragedy. Commission of Inquiry into the Investigation of the Bombing of Air India Flight 182. p. 21. ISBN 9780660199269. ^ Goldman, Zachary K.; Rascoff, Samuel J. (26 April 2016). Global Intelligence Oversight: Governing Security in the Twenty-First Century. Oxford University Press. p. 177. ISBN 9780190458089. ^ "Man Convicted for 1985 Air India Bombing Now Free". Time. Retrieved 21 December 2018. ^ Gilligan, Andrew (21 April 2008). "Ken's adviser is linked to terror group". The London Evening Standard. Archived from the original on 12 June 2009. Retrieved 26 May 2009. ^ Dowd, Allan (18 September 2010). ""Canadian convicted of lying in Air India bomb case", Reuters Sept 18, 2010". Reuters. Archived from the original on 30 December 2010. Retrieved 19 February 2011. ^ a b CBC News (17 June 2010). "Air India case marred by 'inexcusable' errors". CBC. Archived from the original on 19 June 2010. Retrieved 22 June 2010. ^ Reuters. "US to freeze assets of Babbar Khalsa, Intl Sikh Youth Federation Anita Inder Singh Jun 28, 2002". The Indian Express. Archived from the original on 16 March 2012. Retrieved 19 February 2011. ^ Guha, Ramachandra (2008). India After Gandhi: The History of the World's Largest Democracy (illustrated, reprint ed.). Excerpts: Macmillan. ISBN 9780330396110. Retrieved 10 July 2018. ^ a b c "Punjab: The Knights of Falsehood -- Psalms of Terror". Satp.org. Archived from the original on 14 October 2017. Retrieved 29 October 2017. ^ a b Mahmood, Cynthia Keppley (1996). Fighting for Faith and Nation: Dialogues with Sikh Militants. University of Pennsylvania Press. p. 79. ISBN 9780812215922. Archived from the original on 8 July 2018. Retrieved 8 July 2018. ^ "Trouble over Pardon". India Today. Living Media. 10 November 1997. Archived from the original on 3 September 2014. Retrieved 28 August 2014. ^ Swami, Praveen (15–28 November 1997). "A Jathedar is free". Frontline. Archived from the original on 26 July 2018. Retrieved 28 August 2014. ^ a b c d Federal Court of Canada. "Affidavit of Archie M. Barr" (PDF). CBC. Archived from the original (PDF) on 19 March 2009. Retrieved 25 June 2010. ^ chandru. "IMPLEMENTATION OF UNSC RESOLUTION 1373: A Farce by B. Raman". Southasiaanalysis.org. Archived from the original on 28 November 2010. Retrieved 19 February 2011. ^ Guha, Ramachandra (2011). India After Gandhi: The History of the World's Largest Democracy. Pan Macmillan. p. 558. ISBN 9780330540209. ^ Deol, Harnik (2003). Religion and Nationalism in India: The Case of the Punjab. Routledge. p. 102. ISBN 9780203402269. ^ Mehta, Ved (1996). Rajiv Gandhi and Rama's Kingdom. Yale University Press. p. 40. ISBN 9780300068580. ^ Mark Tully, Satish Jacob (1985). "deaths+in+violent" Amritsar; Mrs. Gandhi's Last Battle (e-book ed.). London. p. 147, Ch. 11. Archived from the original on 26 July 2018. Retrieved 26 July 2018. ^ to remove Sikh separatists from the Golden Temple in Amritsar. "Operation BlueStar, 20 Years On". Rediff.com. 6 June 1984. Archived from the original on 3 August 2009. Retrieved 9 August 2009. ^ "Sikh Genocide 1984". Sikhsundesh.net. Archived from the original on 24 July 2011. Retrieved 19 February 2011. ^ a b "Man told blatant lies at Air India trial: court nov 29, 2010". Ctv.ca. Archived from the original on 25 September 2011. Retrieved 19 February 2011. ^ a b "Her Majesty The Queen Against Ripudaman Singh Malik And Ajaib Singh Bagri". Llbc.leg.bc.ca. Retrieved 19 February 2011. ^ "CBC news "Key Characters" March 15, 2005". Canadian Broadcasting Corporation. Archived from the original on 25 November 2010. Retrieved 19 February 2011. ^ a b ""Ex-priest testifies against Bagri" The Tribune (India) December 6, 2003". The Tribune. India. Archived from the original on 23 June 2011. Retrieved 19 February 2011. ^ Zuhair Kashmeri; Brian McAndrew (2005). Soft Target: The Real Story Behind the Air India Disaster — Second Edition. James Lorimer & Company. p. 44. ISBN 978-1-55028-904-6. ^ Matas, Robert. "Bagri Called for the Death of 50,000 Hindus", The Globe and Mail, December 3, 2003"
^ a b Blaise, Clark; Mukherjee, Bharati (1987). The Sorrow and the Terror. "Penguin Books Canada". p. 8. ISBN 978-0-670-81204-2. ^ "Bagri supported A-I hijacking: Witness Bagri supported A-I hijacking: Witness July 08, 2004". In.rediff.com. 8 July 2004. Archived from the original on 22 June 2011. Retrieved 19 February 2011. ^ a b Milewski, Terry (30 April 2007). "In Depth Air India Evidence – Part 1 Plotted in plain sight?". Canadian Broadcasting Corporation. Archived from the original on 25 November 2010. Retrieved 19 February 2011. ^ a b "from affidavit of CSIS Deputy Director Archie Barr, March 1985". Canadian Broadcasting Corporation. 30 April 2007. Archived from the original on 25 November 2010. Retrieved 19 February 2011. ^ a b "Reyat's twisted road to revenge, jail Kim Bolan, Vancouver Sun Published: February 13, 2003". .canada.com. Archived from the original on 22 August 2012. Retrieved 19 February 2011. ^ "1985 Radio Shack Catalog p. 147 Fluorescent Car Clock with 24-Hour Alarm". Radioshackcatalogs.com. Archived from the original on 15 July 2011. Retrieved 19 February 2011. ^ a b c Vancouver, The (9 September 2007). "Portrait of a bomber by the Vancouver SunSeptember 9, 2007". Canada.com. Archived from the original on 23 August 2012. Retrieved 19 February 2011. ^ "11 Feb. 2003: Killer of 329 makes deal for 5-year sentence Kim Bolan, Vancouver Sun Published: Tuesday, February 11, 2003". .canada.com. Archived from the original on 22 August 2012. Retrieved 19 February 2011. ^ Smith, Charlie. "Renee Sarojini Saklikar draws large crowd to SFU Woodward's for launch of new book of poems" (Archive). The Georgia Straight. 14 November 2013. Retrieved on 22 November 2014. ""Reading all these pages of documents, over 17,000 pages of documents from the Air India inquiry alone, I begin to see this phrase repeated all the time: in the woods outside of Duncan, in the woods outside of Duncan," she said. "And that phrase, still to this day, fills me with dread—in the woods outside of Duncan. And it took me a long time to realize that the woods are outside of Paldi."" ^ a b Salim Jiwa (28 April 2003). "Unsolved mysteries as Air India trial begins". flight182.com. Archived from the original on 21 October 2007. ^ a b Royal Canadian Mounted Police (11 February 1993). "Air India Investigation: SIRC Briefing" (PDF). CBC. Archived (PDF) from the original on 3 September 2010. Retrieved 24 June 2010. ^ "CBC New: Evidence". Canadian Broadcasting Corporation. 30 April 2007. Archived from the original on 25 November 2010. Retrieved 19 February 2011. ^ "Kanishka bombmaker Inderjit Reyat found guilty of perjury Sep 19, 2010". Dnaindia.com. 19 September 2010. Archived from the original on 22 September 2010. Retrieved 19 February 2011. ^ Milewski, Terry (30 April 2007). "Evidence – Part 2 Plotted in plain sight?". Canadian Broadcasting Corporation. Archived from the original on 25 November 2010. Retrieved 19 February 2011. ^ "Scanned Document" (PDF). CBC News. Archived (PDF) from the original on 27 March 2009. Retrieved 10 August 2009. ^ Milewski, Terry (28 June 2007). "Sikh politics in Canada". CBC News. Archived from the original on 1 June 2009. Retrieved 24 June 2010. ^ "Scanned Document" (PDF). Archived (PDF) from the original on 3 November 2012. Retrieved 24 March 2018. ^ "Terror of Air India Flight 182 comes to small screen". Straight.com. 19 June 2008. Archived from the original on 19 February 2011. Retrieved 19 February 2011. ^ "Air India trial focus shifts to Bagri". Canadian Broadcasting Corporation. 2 December 2003. Archived from the original on 12 July 2018. Retrieved 19 February 2011. ^ CBC News (5 May 2003). "Agent recalls checking fateful Air India bag". CBC. Archived from the original on 15 August 2012. Retrieved 25 June 2010. ^ "Death of Flight 182". Flight182.com. Archived from the original on 15 May 2011. Retrieved 19 February 2011. ^ "R. v. Malik and Bagri". Supreme Court of British Columbia. 16 March 2005. p. 24. Archived from the original on 20 September 2010. Retrieved 16 February 2015. ^ a b Summers, Chris (16 March 2010). "Deadly puzzle remains a mystery". BBC. Archived from the original on 1 July 2010. Retrieved 24 June 2010. ^ Sun, Vancouver (9 September 2007). ""Reyat's twisted road to revenge, jail " Vancouver Sun September 9, 2007". Canada.com. Archived from the original on 24 January 2015. Retrieved 19 February 2011. ^ Times, Christopher S. Wren and Special To the New York. "BLAST KILLS 2 AS CARGO IS UNLOADED FROM CANADIAN AIRLINER IN JAPAN". Archived from the original on 25 March 2018. Retrieved 24 March 2018. ^ a b c "Explosive Evidence." Mayday. ^ "flight182.com". www.flight182.com. Archived from the original on 11 July 2011. Retrieved 24 March 2018. ^ a b Kirpal, p. 31. "Air India Boeing 747 aircraft VT-EFO 'Kanisha' was operating flight AI-181 (Bombay-Delhi-Frankfurt-Toronto-Montreal) on 22nd June, 1985. From Montreal it becomes AI-182 from Mirabel to Heathrow Airport, London en route to Delhi and Bombay." ^ " Keel, Paul; et al. (24 June 1985). "Jumbo crashes killing 325". The Guardian. UK. ^ "Two held for '85 Kanishka crash". The Tribune. India. Associated Press. 28 October 2000. Archived from the original on 27 June 2008. Retrieved 28 April 2008. ^ "Special Report: Air India Flight 182". Archived from the original on 7 October 2009. Retrieved 16 September 2009. ^ "CVR transcript Air India Flight 182–23 JUN 1985". Aviation Safety Network. Archived from the original on 3 April 2010. Retrieved 21 July 2008. ^ Vancouver, The (9 September 2007). "Portrait of a bomber". Canada.com. Archived from the original on 29 July 2009. Retrieved 18 June 2010. ^ Report of the Court Investigating Accident to Air India Boeing 747 Aircraft VT-EFO, "Kanishka" on 23 June 1985 Archived 16 June 2007 at the Wayback Machine, Hon'ble Mr. Justice B.N. Kirpal Judge, High Court of Delhi, 26 February 1986. ^ "CBC News Online March 15, 2005". Canadian Broadcasting Corporation. Archived from the original on 23 June 2011. Retrieved 19 February 2011. ^ "Key witness was spurred to get information: defence". The Tribune. India. 26 November 2003. Archived from the original on 29 July 2010. Retrieved 24 June 2010. ^ Times, R. W. Apple Jr. and Special To the New York. "329 LOST ON AIR-INDIA PLANE AFTER CRASH NEAR IRELAND; BOMB IS SUSPECTED AS CAUSE". Archived from the original on 25 March 2018. Retrieved 24 March 2018. ^ Witkin, Richard. "JUMBO-JET CRASH MIGHT BE A FIRST". Archived from the original on 25 March 2018. Retrieved 24 March 2018. ^ "Air India Flight 182 Report". Montereypeninsulaairport.com. Archived from the original on 13 February 2011. Retrieved 19 February 2011. ^ Jiwa, Salim (1986). The Death of Air India Flight 182. London: W.H. Allen & Co. plc. p. 139. ISBN 0-352-31952-6. ^ "1985: Air India Flight 182 crashes into the Atlantic — CBC Archives". Archived from the original on 21 October 2017. Retrieved 24 March 2018. ^ Pres (24 June 1985). "Passengers and Crew Aboard Air India Jetliner". The New York Times. Associated Press. Following is a list of people aboard Air-India Flight 182, which crashed into the sea off the Irish coast yesterday. The list was made public by the airline, and relatives provided additional information. Parents and children are sometimes listed as one passenger, and the number does not add up to 329, although Air-India in London said there were 307 passengers and 22 crew members aboard the flight. ^ Shah, Sabir. "Terror incidents claiming more than 150 lives each in last 100 years Archived 21 October 2013 at the Wayback Machine." The News. Saturday 19 October 2013. Retrieved on 13 November 2014. ^ a b "Flight 182: Destination disaster" (Archive). India Today. 23 December 2013. Retrieved on 13 November 2014. ^ a b "'I understand Air India was the first file Harper asked for' Archived 11 December 2014 at the Wayback Machine." Rediff.com. 29 June 2010. Retrieved on 7 December 2014. "He said the victims included 86 children; 29 families were completely wiped out -- both spouses and all children killed; 32 persons were left alone -- their spouse and all children were killed; six couples lost all their children; two children lost both parents." ^ a b "Dreams that died with the bombing" (Archive). Surrey Now at Canada.com. 4 July 2008. Retrieved on 14 November 2014. ^ Smith, Charlie. "Terror of Air India Flight 182 comes to small screen" (Archive). The Georgia Straight. 18 June 2008. Retrieved on 29 October 2014. "However, the authors emphasized that the vast majority of the victims were Hindus from southern Ontario, whereas the perpetrators were extremist Sikhs from British Columbia." ^ "Sikhs mourn Air-India victims." Montreal Gazette. Wednesday 26 June 1985. p. A1. Retrieved on Google News (p. 1/111) on 22 October 2014. ^ "Toronto reveals Air India memorial" (Archive). Canwest News Service. 23 June 2007. Retrieved on 28 October 2014. "Most of the 329 people killed aboard the flight were from the Toronto area." ^ "Oct. 28, 2000: Friday's charges came after a 15-year probe Archived 12 February 2015 at the Wayback Machine." The Vancouver Sun. 30 July 2007. Retrieved on 5 December 2014. "While several B.C. families struggled with their grief, the majority of those who perished came from Toronto and Montreal." ^ Final Report: "Volume 2: Part 1: Pre-Bombing Chapter 5: The Day of the Bombing" p. 560 (PDF p. 14/40). "In fact, 202 passengers boarded at Pearson for the flight to India, with the remaining 105 joining at Mirabel." pp. 36, 43." ^ Lederman, Marsha. "Poet's new book communes with the ghosts of the Air India bombing Archived 30 January 2017 at the Wayback Machine." The Globe and Mail. Retrieved on 22 November 2014. "They flew out of Montreal in the early hours (UTC) of June 23, 1985, on Air India Flight 182." ^ a b Kirpal, p. 33. ^ Times, Douglas Martin and Special To the New York. "AS INDIANS' RANKS IN CANADA GROW, OLD CONFLICTS ARE ALSO TRANSPLANTED". Archived from the original on 25 March 2018. Retrieved 24 March 2018. ^ "Save BIG with $9.99 .COMs from GoDaddy!". Go Daddy. Archived from the original on 25 March 2018. Retrieved 24 March 2018. ^ a b "India". 24 March 2018. Archived from the original on 25 March 2018. Retrieved 24 March 2018 – via NYTimes.com. ^ Raman, B. (20 June 2010). "AFTER KANISHKA, MUMBAI 26/11----AFTER 26/11 ?". South Asia Analysis Group. Archived from the original on 20 June 2010. Retrieved 24 June 2010. ^ "Canadian Judge Says Sikh Guilty in 2 Bomb Deaths". Orlando Sentinel. 11 May 1991. Archived from the original on 6 April 2012. Retrieved 24 June 2010. ^ "IN DEPTH: AIR INDIA Key characters". CBC News. 15 March 2005. Archived from the original on 20 June 2010. Retrieved 24 June 2010. ^ Puneet Singh Lamba. "1984 Sikh Massacres: Victory to the Mob, by Khushwant Singh. Outlook, Aug. 22, 2005 – The Nanavati report is utter garbage. All the killers are roaming freely". Sikhtimes.com. Archived from the original on 19 July 2011. Retrieved 19 February 2011. ^ Milewski, Terry (28 June 2007). "Sikh politics in Canada. Symbols and suits. Sikh extremism enters mainstream Canadian politics". CBC. Archived from the original on 1 June 2009. Retrieved 31 May 2009. ^ "Air India suspects are not guilty". BBC. 16 March 2005. Archived from the original on 24 June 2010. Retrieved 24 June 2010. ^ "IN DEPTH: AIR INDIA Crime Files: The Mole". CBC News. 27 August 2003. Archived from the original on 4 February 2005. Retrieved 24 June 2010. ^ Krauss, Clifford (17 March 2010). "Canadian Sikhs Are Cleared in 1985 Air India Bombing". The New York Times. Archived from the original on 10 November 2012. Retrieved 24 June 2010. ^ "Crown attacks credibility of defence witness at Air India trial". CBC News. 8 June 2004. Archived from the original on 22 July 2012. Retrieved 24 June 2010. ^ Vikram Jit Singh (4 August 2007). "Operation Silence". Tehelka. Archived from the original on 12 September 2012. Retrieved 27 July 2007. ^ "Air India inquiry will hear of alleged Parmar confession". CBC News. 23 September 2007. Archived from the original on 13 October 2007. Retrieved 25 September 2007. ^ Kim Bolan, (25 September 2007). "Confession had false details, inquiry told: RCMP 'fully' checked out alleged Parmar confession, inspector tells commissioner". Vancouver Sun. Canada. Archived from the original on 22 October 2007. ^ "Timeline". CTV News. Archived from the original on 22 March 2012. Retrieved 24 June 2010. ^ "Key Characters CBC". Archived from the original on 20 June 2010. Retrieved 24 March 2018. ^ "Malik, Bagri not guilty in Air India bombings". CTV News. 16 March 2005. Archived from the original on 3 October 2006. Retrieved 24 June 2010. ^ Fong, Petti (24 June 2010). "Air India families wait for answers 25 years later". Toronto Star. Archived from the original on 19 June 2010. Retrieved 25 June 2010. ^ Saklikar, Renee (23 June 2010). "The lesson from Air India Flight 182: Curiosity can save us". The Georgia Straight. Archived from the original on 25 June 2010. Retrieved 24 June 2010. ^ Bolan, Kim (9 March 2010). "Jury dismissed at Reyat perjury trial". Vancouver Sun. Canada via Times Colonist. p. A1. ^ "Air India trial gets $7.2M high-tech courtroom". The Canadian Press via CP24. 16 August 2002. Archived from the original on 3 October 2011. Retrieved 24 June 2010. ^ "Supreme Court of British Columbia: Her Majesty the Queen Against Ripudaman Singh Malik and Ajaib Singh Bagri". Courts.gov.bc.ca. Archived from the original on 20 September 2010. Retrieved 10 August 2009. ^ "Malik, Bagri asked to pay Air India legal fees". CBC News. 25 November 2005. Archived from the original on 29 May 2007. Retrieved 24 June 2010. ^ Ward, Doug (12 March 2010). "New jury for Inderjit Singh Reyat perjury case on May 17". Vancouver Sun. Canada via Calgary Herald. Archived from the original on 25 April 2010. Retrieved 24 June 2010. ^ Bolan, Kim (9 July 2008). "Released Air India bomber rejoins family". National Post. Canada. Retrieved 24 June 2010. ^ "Air India bomber's perjury trial stalled as jury dismissed". Thaindian.com. Archived from the original on 20 May 2010. Retrieved 18 June 2010. ^ Bains, Camille (19 September 2010). "Air India bomb maker guilty of perjury". Lethbridge Herald. p. A2. ^ Camille Bains The Canadian Press (7 January 2011). "Air India bomber jailed nine years for perjury". Toronto Star. Toronto. Archived from the original on 10 January 2011. Retrieved 19 February 2011. ^ Bains, Camille (8 February 2011). "Reyat to appeal Air India perjury conviction". Archived from the original on 29 April 2011. Retrieved 24 March 2018 – via The Globe and Mail. ^ Dhillon, Sunny (13 March 2014). "Appeal dismissed for Air India disaster's lone convicted criminal". Globe and Mail. Archived from the original on 6 January 2016. Retrieved 15 March 2014. ^ Natalie Clancy, Air India bomb-maker released from halfway house; now considered 'low risk' by National Parole Board Archived 14 February 2017 at the Wayback Machine, CBC News, 14 February 2017. Retrieved 14 February 2016. ^ "The Air India Trial" (PDF). University of Toronto Faculty of Law. June 2005. Archived (PDF) from the original on 28 June 2010. Retrieved 24 June 2010. ^ Noronha, Charmaine (17 June 2010). "Canadian officials dropped ball before Air India bombing, inquiry finds". Associated Press via The Seattle Times. Archived from the original on 27 June 2010. Retrieved 24 June 2010. ^ "Former CSIS chief wishes tapes weren't erased". CTV News. 19 September 2007. Archived from the original on 25 September 2011. Retrieved 24 June 2010. ^ "CBC News in Depth: Air India – Bombing of Air India Flight 182". Canadian Broadcasting Corporation. Archived from the original on 1 December 2008. Retrieved 10 August 2009. ^ "1995 Recipient: Tara Singh Hayer – Surrey : Order of BC". www.orderofbc.gov.bc.ca. Archived from the original on 25 March 2018. Retrieved 24 March 2018. ^ Summers, Chris (17 March 2005). "Call for police to solve Sikh murder". BBC. Archived from the original on 7 May 2010. Retrieved 24 June 2010. ^ a b Bolan, Kim (18 November 2009). "Tara Singh Hayer murder probe still active, 11 years later". Vancouver Sun. Canada. Archived from the original on 12 March 2010. Retrieved 24 June 2010. ^ Ray, Ashis. "Reviving a 25-year-old tragedy - Times of India". The Times of India. Archived from the original on 26 July 2018. Retrieved 27 June 2018. In 1998, Hayer was shot dead, which made his affidavit inadmissible in court. ^ Duthel, Heinz (2014). Global Secret and Intelligence Services I: Hidden Systems that deliver Unforgettable Customer Service. BoD – Books on Demand. p. 492. ISBN 9783738607710. Archived from the original on 26 July 2018. Retrieved 27 June 2018. Because of his assassination the affidavit was inadmissible in court. ^ Vancouver Police Polygraph Unit (28 October 2000). "Interview of Bagri, Ajaib Singh" (PDF). CBC. Archived (PDF) from the original on 3 September 2010. Retrieved 24 June 2010. ^ "Easter denies CSIS spied on Air India bombers". CTV News. 3 June 2003. Archived from the original on 27 July 2011. Retrieved 24 June 2010. ^ CBC News (1 May 2006). "Harper launches Air India inquiry". CBC. Archived from the original on 1 September 2009. Retrieved 22 June 2010. ^ Government of Canada (1 May 2006). "ACommission of Inquiry into the Investigation of the Bombing of Air India Flight 182". Archived from the original on 12 February 2007. Retrieved 23 June 2010. ^ CBC News (21 June 2006). "Air India inquiry will reassure victims' families, Major vows". CBC. Archived from the original on 1 September 2009. Retrieved 22 June 2010. ^ Government of Canada (1 May 2006). "A Commission of Inquiry into the Investigation of the Bombing of Air India Flight 182". Archived from the original on 20 June 2010. Retrieved 23 June 2010. ^ "Address by Prime Minister Paul Martin at the Air India Memorial Ceremony". Government of Canada. 23 June 2005. Archived from the original on 25 July 2018. Retrieved 24 July 2018. ^ MacQueen, Ken and John Geddes. "Air India: After 22 years, now's the time for truth Archived 16 September 2011 at the Wayback Machine." Maclean's. 28 May 2007. Retrieved on 17 December 2009. 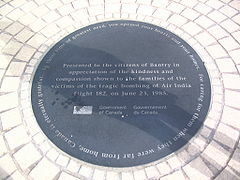 ^ "Minister Martin to remember the victims of the 1985 bombing of Air India Flight 182". Department of Foreign Affairs. 23 June 2010. Archived from the original on 1 July 2010. Retrieved 24 June 2010. ^ Mendis, Sean (10 February 2003). "18 Years of Personal Reflections on AI 182". Airwhiners.net. Archived from the original on 29 November 2014. Retrieved 5 June 2013. ^ CBC News (11 August 2006). "Vancouver groundbreaking held for Air India memorial". CBC. Archived from the original on 1 September 2009. Retrieved 22 June 2010. ^ "Memorial to victims of Air India bombing inaugurated in Lachine Archived 9 December 2014 at the Wayback Machine." CTV Television Network Montreal. Sunday 5 December 2010. Retrieved on 7 December 2014. 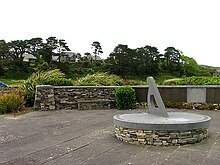 ^ a b "Canada unveils another memorial to Air India victims". Deccan Herald. Archived from the original on 25 March 2018. Retrieved 24 March 2018. ^ CBC commissions documentary on Air India tragedy Archived 22 October 2007 at the Wayback Machine, CBC Arts, 21 June 2007. ^ Sturla Gunnarsson. "Flight 182". Doc Zone. CBC Television. ^ "Air India 182". CBC News. 13 June 2010. Archived from the original on 30 March 2009. Retrieved 24 June 2010. ^ "Mayday : Explosive Evidence". Discovery Channel. Archived from the original on 24 February 2010. Retrieved 24 June 2010. ^ Salim Jiwa; Don Hauka (1986). The Death of Air India Flight 182. Star. ISBN 978-0-352-31952-4. ^ "American Author Bharati Mukherjee in Istanbul". United States Department of State. Archived from the original on 27 May 2010. Retrieved 24 June 2010. ^ ISBN 978-1-897151-32-7 "The Soul of All Great Designs at Cormorant Books". Cormorantbooks.com. Archived from the original on 12 August 2009. Retrieved 10 August 2009. ^ "entrance awards." Laurentian University. Retrieved on 23 February 2012. ^ "Donald George Lougheed Memorial Scholarship" (Archive). University of Manitoba. Retrieved on 12 November 2014. ^ "2010 Heroes". Archived from the original on 2 February 2014. Retrieved 30 January 2014. Honorable Mr. Justice B. N. Kirpal (Judge, High Court of Delhi). Indian Government Report of the Court Investigating the accident of Air India Boeing 747 Aircraft VT-EFO, "Kanishka" on 23 June 1985 (PDF) (Archive). 26 February 1986. Somani, Alia Rehana. "Broken Passages and Broken Promises: Reconstructing the Komagata Maru and Air India Cases" (PhD thesis) (Archive). School of Graduate and Postdoctoral Studies, University of Western Ontario, 2012. Wikimedia Commons has media related to Air India Flight 182.